Used in general purpose cutting when using a high speed or masonry saw. Turbo blades offer a faster cut due to the serrated segment design, allowing less surface to surface contact. Dry cutting general purpose blade with .060" thick edge for use with portable tools, circular saws and worm drive saws. Designed for cutting brick and masonry material. Faster cut rate at a constant depth. These diamond blades contain 10 percent more diamond than standard blades, providing long life. Turbo rim for fast, smooth cuts. Cuts concrete, brick, paver, sandstone, stucco and roof tile. These diamond blades contain 10 percent more diamond than standard blades providing long life for blade. Continuous rim for ultra smooth cuts; use to cut ceramic tile, granite, marble, slate and porcelain. These diamond blades contain 10 percent more diamond than standard blades, providing long life. Turbo rim for fast, smooth cuts. Cuts concrete, brick, paver, sandstone, stucco and roof tile. Used in general purpose cutting when using a high speed or masonry saw. Turbo blades offer a faster cut due to the serrated segment design, allowing less surface to surface contact. High Performance diamond matrix provides longer life and enhanced material removal with a thinner kerf to increase speed of cut while minimizing dust. Used in applications such as cutting block, masonry siding products, and other masonry materials. These diamond blades contain 10 percent more diamond than standard blades providing long life for blade. Continuous rim for ultra smooth cuts; use to cut ceramic tile, granite, marble, slate and porcelain. Continuous rim for a smooth wet or dry cut in granite, marble, glass and other hard, dense tiles with a tile or masonry saw. Optimized, symmetric 60 degree tooth design. Innovative heat vent expansion slot designs. Fully heat treated. Cuts gutters, vinyl siding & PVC piping. High performance diamond matrix provides long lasting and fast cutting all types of tile and stone. .60 blade thickness. Dry cutting general purpose blade with .090" thick edge for use with portable tools, circular saws and worm drive saws. Designed for cutting brick and masonry material. Faster cut rate at a constant depth. Dry cutting general purpose blade with .090" thick edge for use with portable tools, circular saws and worm drive saws. Designed for cutting brick and masonry material. Faster cut rate at a constant depth. For use with power handsaw No.1640VS. For cutoffs, miters, and other fine cutting of wood, wood composites and plastics. Ultra-fine teeth design provides smooth, tear-free cuts. Flex-resistant, high alloy steel blade guides for accurate guidance. For use with power handsaw No.1640VS. For faster cutting of wood, wood composites and plastics. Ultra-fine teeth design provides smooth, tear-free cuts. Flex-resistant, high alloy steel blade guide for accurate guidance. Continuous rim for a smooth wet or dry cut in granite, marble, glass and other hard, dense tiles with a tile or masonry saw. Continuous rim for a smooth wet or dry cut in granite, marble, glass and other hard, dense tiles with a tile or masonry saw. These diamond blades contain 10 percent more diamond than standard blades, providing long life. Turbo rim for fast, smooth cuts. Cuts concrete, brick, paver, sandstone, stucco and roof tile. Used in general purpose cutting when using a high speed or masonry saw. Turbo blades offer a faster cut due to the serrated segment design, allowing less surface to surface contact. These diamond blades contain 10 percent more diamond than standard blades providing long life for blade. Continuous rim for ultra smooth cuts; use to cut ceramic tile, granite, marble, slate and porcelain. Used in general purpose cutting when using a high speed or masonry saw. Turbo blades offer a faster cut due to the serrated segment design, allowing less surface to surface contact. Continuous rim diamond replacement blade will fit #48190 (360.7975) and #48191 (638.5017) Fusion wet saws; fits many other 5/8" arbor wet saws. High performance diamond matrix provides long lasting and fast cutting all types of tile and stone. .60 blade thickness. Continuous rim for a smooth wet or dry cut in granite, marble, glass and other hard, dense tiles with a tile or masonry saw. Wave style core enhances the cutting speed, continuous rim turbo style for a smooth cut in wet or dry cuts with an electric circular saw or right angle grinder. Includes 5/8" bushing. Fast cutting. Dry cutting general purpose blade with .080" thick edge for use with portable tools, circular saws and worm drive saws. Designed for fast shallow cutting in brick, block and tile. Matrix design minimizes chipping. Steel body delivers constant depth of cut. Thin kerf blade for circular and miter saws. Designed for smooth fast cuts. Durable, machine welded carbide tips. Anti-kick back safety feature. C45, 0 degree hook angle, 6,500 RPM. Continuous rim for chip-free cutting. Can be used on right-angle grinders and hand saws as well as tile saws for both wet and dry cutting. Dry cutting general purpose blade with .080" thick edge for use with portable tools, circular saws and worm drive saws. Designed for fast shallow cutting in brick, block and tile. Matrix design minimizes chipping. Steel body delivers constant depth of cut. 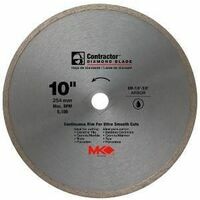 Dry cutting blade with .080" rim edge thickness for use on most electric and cordless circular saws. Designed for cutting HardiPlank, wall board and fiber cement siding. Composite decking blade for cutting composite decking materials. For maximum performance and a high quality finish. Modified triple tooth grind design. Perma-Shield, non-stick coating and specific TiCo hi-density carbide to deliver more efficient and cleaner cuts with no swirl marks, less "gumming" of blade teeth and longer cutting life. Wave style core enhances the cutting speed, continuous rim turbo style for a smooth cut in wet or dry cuts with an electric circular saw or right angle grinder. Includes 5/8" bushing. Fast cutting. High performance diamond matrix provides long lasting and fast cutting all types of tile and stone. .60 blade thickness. Used in general purpose cutting when using a high speed or masonry saw. Turbo blades offer a faster cut due to the serrated segment design, allowing less surface to surface contact. Continuous rim for chip-free cutting. Can be used on right-angle grinders and hand saws as well as tile saws for both wet and dry cutting. Dry cutting general purpose blade with .090" thick edge for use with portable tools, circular saws and worm drive saws. Designed for fast shallow cutting in brick, block and tile. Matrix design minimizes chipping. Steel body delivers constant depth of cut. Thin kerf, .087", saw blade designed for miter saws and table saws. A permanent PermaShield coating keeps this blade free from gumming and corrosion, and laser-cut stabilizer vents reduce vibration and heat buildup for more precise cuts. Use for on the job cutting of nonferrous metal such as copper pipe, aluminum extensions, brass plate and plastics. TCG tooth design, .106" plate, -6 degree hook angle, 10,000 max rpm. Continuous rim for a smooth wet or dry cut in granite, marble, glass and other hard, dense tiles with a tile or masonry saw. These blades contain 30 percent more diamond than standard blades, providing faster cuts and longest life. Turbo rim for fast, smooth cuts. Cuts concrete, brick, paver, sandstone, stucco and roof tile. Wet cutting premium grade blade with .050" edge thickness for use with all tile saws. Designed for cutting porcelain and vitreous tile. Used in general purpose cutting when using a high speed or masonry saw. Turbo blades offer a faster cut due to the serrated segment design, allowing less surface to surface contact. Diablo's next generation aluminum saw blades are optimized for cutting thin (up to 1/8"), medium (3/32 to 1/4") and thick (3/16 to 7/16") aluminum metal. The specially formulated metal cutting carbide teeth feature a triple chip grind (TCG) tooth design for clean, burr-free finishes, virtually eliminating any type of rework. Tri-metal shock resistant brazing allows these aluminum blades to slice through metal materials while withstanding extreme impact for maximum durability. TiCo super density micro grain carbide for extreme cutting life and clog free cuts. Perma-Shield non-stick coating for protection against heat, gumming and corrosion. Laser cut stabilizer vents for trapping noise and reducing vibration for accuracy and durability. These radical blades withstand impact, reduce wear, provide clog free cuts and last longer than standard carbide in metal cutting applications. Teeth Type: 80 triple chip grind. Cutting depth: 4". Thickness: 0.071". Maximum speed: 7000 rpm. Kerf: 0.094". For miter/slide miter saw and table saw. Dry cutting general purpose blade with .090" thick edge for use with portable tools, circular saws and worm drive saws. Designed for fast shallow cutting in brick, block and tile. Matrix design minimizes chipping. Steel body delivers constant depth of cut. These blades contain 30 percent more diamond than standard blades, providing faster cuts and longest life. Turbo rim for fast, smooth cuts. Cuts concrete, brick, paver, sandstone, stucco and roof tile. Wave style core enhances the cutting speed, continuous rim turbo style for a smooth cut in wet or dry cuts with an electric circular saw or right angle grinder. Includes 5/8" bushing. Fast cutting. Use with Rage3/Rage3DB saws; maximum RPM 3000; kerf .078" (5/64"). Dry cutting general purpose blade with .060" thick edge for use with portable tools, circular saws and worm drive saws. Designed for cutting brick and masonry material. Faster cut rate at a constant depth. Used in general purpose cutting when using a high speed or masonry saw. Turbo blades offer a faster cut due to the serrated segment design, allowing less surface to surface contact. Wet cutting premium grade blade with .050" edge thickness for use with all tile saws. Designed for cutting porcelain and vitreous tile. Continuous rim for chip-free cutting. Can be used on right-angle grinders and hand saws as well as tile saws for both wet and dry cutting. Dry cutting general purpose blade with .080" thick edge for use with portable tools, circular saws and worm drive saws. Designed for cutting brick and masonry material. Faster cut rate at a constant depth. These diamond blades contain 10 percent more diamond than standard blades, providing long life. Turbo rim for fast, smooth cuts. Cuts concrete, brick, paver, sandstone, stucco and roof tile. Thin kerf, 103", saw blade designed to cut through ferrous metals quickly and accurately leaving clean, burr free cuts. Used for cutting steel studs, steel pipe and steel sheet. For most mild steels under 1/8" thick. Used for crosscutting oak, pine, malamine, plywood and moulding. TCG tooth design, .090" plate, -2 degree hook angle, 1,800 max rpm. Laser cut blade with metal cutting grade carbide teeth, anti-kickback tooth shoulder and laser cut anti-vibration vents.